Kementerian Komunikasi dan Informatika Republik Indonesia - Kementerian Kominfo or referred to as "KOMINFO" is the Ministry of Communications and Informatics of Republic Indonesia. Kementerian KOMINFO was formerly known as Departemen Komunikasi dan Informatika (Depkominfo) or the Department of Communications and Informatics. Kementerian KOMINFO is an Indonesian ministry which oversees the communication and informatics affairs. Kementerian KOMINFO is responsible directly to the President of Republic Indonesia and led by a minister. Since 27 October 2014, Kementerian KOMINFO was led by Rudiantara as the Minister for Communications and Information Technology (MENKOMINFO). Rudiantara was appointed by the President Joko "Jokowi" Widodo as MENKOMINFO in the Working Cabinet (Kabinet Kerja) Indonesia to replace Tifatul Sembiring. 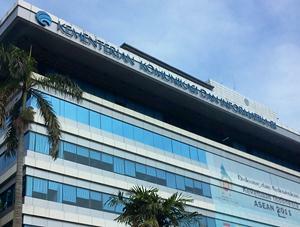 Kementerian KOMINFO is based in Jakarta and its head office is registered at Jl Medan Merdeka Barat No 9 Jakarta 10110. According to information found in Kementerian KOMINFO's website as cited by JobsCDC.com, Kementerian KOMINFO is organized as 7 units and 5 expert staffs, namely General Secretariat, Directorate Generals (DG) of Resources and Post Device and Informatics, DG of the Post and Information Implementation, DG of Informatics Applications, DG of Public Information and Communication, General Inspectorate, Agency of Research and Human Resource Development, Expert Staff of Law, Expert Staff of Social, Economics and Culture, Expert Staff of Communication and Mass Media, Expert Staff of Technology, and Expert Staff of Politics and Security. Strong understanding of taxation (PPh 21.22 and 23). Have tax brevet is preferred. Willing to work at certain times outside office hours. Minimum D3 degree in Secretary, Communication, Office Administration. Minimum S1 degree in Communication. Have good writing and online journalism skills. Have good understanding of technical terms in information technology. Willing to be assigned to cover the field. Minimum D3 degree in Graphic Design. Mastering design programs; Photoshop / Illustrator. Able to process data into charts. Have good video processing skill is preferred. Minimum S1 degree in Law. Have good understanding about the litigation process (preferably have PKPA certificate). Able to write letters in English. Advanced skill in making documents, presentations, and spread sheets. Willing at certain times to work outside office hours (on holidays). Have good understanding about the legal drafting (preferably have legal drafting certificate). Minimum D3/S1 degree in Public Administration, Commerce Administration, Economics. Minimum D3/S1 degree in Informatics Engineering, Computer Engineering. Possess expertise certification in the field of networking. Minimum 2 years of experience in the field of networking. Possess expertise certification in the field of data center. Minimum 2 years of experience in the field of data center. Minimum D3 degree in Information Technology or other related IT majors. Mastering PHP or Java Programming, Mobile Application developing, Web Service (API), MySQL Database Management, POSTGRESQL, HTML, CSS, JQuery. Have experience and expertise in developing Web-based applications and Android / iOS (preferred). Mastering the Programming Language, preferably mastering PHP, CSS, HTML, Jquery. Mastering the Operation of Mysql / Sql / Oracle Databases. Mastering the Linux Operating System for server setup and maintenance. JobsCDC.com now available on android device. Download now on Google Play here. Please be aware of recruitment fraud. The entire stage of this selection process is free of charge. Kementerian Komunikasi dan Informatika - D3, S1 PPNPN APTIKA KOMINFO January 2019 will never ask for fees or upfront payments for any purposes during the recruitment process such as transportation and accommodation.